Lipoplasty, also called liposuction, liposculpture or lipectomy, is a surgical technique in which specific areas of fat under the skin are permanently removed through a small incision in the skin using a cannula which is a hollow metal tube and a suction pump. The fat is sucked out through the tube with the aim of re-shaping the body in that area. After puberty human body does not create new fat cells, when a person gains weight, the fat cells that one has, expand or grow bigger. Liposuction permanently removes fat cells to improve the body's shape. If you gain weight after liposuction, it goes to the old fat cells that remain in the body, so that the fatty deposits that existed before liposuction can no longer blow out of proportion to the now thinner surrounding area. Suitable candidates for lipoplasty surgery are average weight people with firm, elastic skin who have pockets of fat in specific areas. It is not an alternative to sensible dieting, a cure for obesity or a treatment for cellulite. In Fact, it is a method of removing fat that does not respond to a healthy diet or regular exercise. There is no definite age or weight limit for patients who are "good candidates" for lipoplasty surgery. Many lipoplasty patients are of average size but are concerned about localized accumulations of fat. However, some of the happiest patients have been individuals who are somewhat obese. A good candidate usually has one or more localized accumulations of fat that can be removed by lipoplasty. Lipoplasty in Younger Patients - In younger patients skin is more elastic, therefore, once the procedure has finished, skin can tighten up around the treated areas. This is common place in liposuction in the arms and stomach areas where skin is known to tighten to its genetically predetermined position. Lipoplasty in Older Patients - In older patients however, skin elasticity is not what it is in younger patients. Due to this, other procedures, such as abdominoplasty (tummy tuck), rhytidectomy (facelift) and mastopexy (breast lift) are recommended as they will remove any excess skin left over from the liposuction surgery. The anesthesia may be local, regional i.e. via an epidural injection, or general, depending upon the area treated, the technique used, and your surgeon’s or doctor’s recommendations for you. Depending upon the type of anesthesia used, you may also have to fast (eat or drink) nothing during the night before and morning of your surgery. Small incisions, around 5mm or so in length, are made around the area to be treated, and a hollow suction tube called cannula is put in and then moved around under the skin to break up the unwanted fat. The fat is removed either manually with a large syringe, or with the use of a vacuum pump. The overlying skin remains attached to the connective tissue and underlying muscles of the skin during the operation. A thin blanket of fat is left under the skin to help prevent rippling or bumpy skin occurring after the liposuction is over. The time required to perform liposuction varies considerably, depending on the size of the area, the amount of fat being removed, the type of anesthesia and technique used. The basic technique of lipoplasty or liposuction, as described above, is used in all patients undergoing this procedure. However, as the procedure has been improved and developed, several variations have been introduced. These are described below. 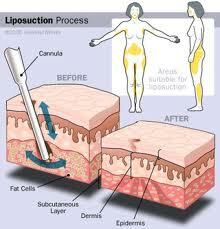 Laser-Assisted Lipoplasty - Laser assisted Lipoplasty involves use of thermal energy to affect lipolysis. Fluid Injection - In Fluid Injection technique, a solution of lignocaine (an anaesthetic) and adrenaline is injected into the fatty areas before liposuction. This helps the practitioner to remove fat more easily, reduces blood loss, and bruising. Hence, it reduces any pain or discomfort that the patient may feel. Tumescent Liposuction - Large volumes of fluid - sometimes as much as three times the amount of fat to be removed – are injected into the fatty area. This procedure is usually performed on patients who only need a local anaesthetic, but it usually takes much longer to do the treatment, sometimes up to 4 or 5 hours for large areas of fat removal. The Super-Wet Technique - Similar to the tumescent technique above, except that less fluid is used. This is usually performed under a sedative given through a syringe into the vein, or via a general anaesthetic, and typically takes around one or two hours. Ultrasound – Assisted Lipoplasty (UAL) - For this procedure a special cannula that produces ultrasonic rays of energy is used. The energy breaks down the walls of the fat cells which make the fat liquid and this liquid is then removed by standard liposuction. After the fat is removed, the wounds are stitched and sometimes a drainage tube is inserted for a few days to prevent any fluid buildup. There’ll be some follow-up appointments to monitor your Liposuction recovery, so be sure and keep them. With careful self-care and compliance with the plastic surgeon’s advice, most people have a complete Liposuction recovery and a happy outcome. Lipoplasty is one of the most cost effective cosmetic procedures which have a number of improved techniques. Lipoplasty, unlike regular surgery, is minimally invasive. Yet it can provide great fat removal results for those who are not heavily overweight by providing them with nicely sculpted, shapely bodies in a short time. The fat cells that are removed with liposuction will not return, so the areas contoured have a reduced ability for fat production--meaning that it is unlikely to regain your "trouble" spots. Patients who have undergone liposuction say that they feel more confidence in their bodies. Some engage in activities that they would not have prior to the procedure and feel more confident in their clothing. The number of patients opting for this surgery is increasing day by day because the various benefit it offers. Lipoplasty has become a much safer procedure over the last 10 years with the development of newer techniques. This has caused it to become one of the most common cosmetic surgery procedures performed today. Patients who are not clinically obese and who are realistic about this treatment can successfully achieve an improved body shape by reducing the amount of fat in specific areas of their bodies. 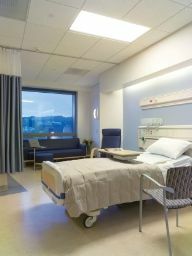 There is often some post-surgery pain or discomfort, temporary bruising and swelling and some restriction on activity. Serious complications after a Liposuction are rare, but if they do happen, you should notify your plastic surgeon immediately. Some complications watch for are as follows. The doctor or surgeon must have advanced surgical skills and be experienced in cosmetic surgery to perform procedures that involve the removal of a large amount of fat i.e. more than 5 litres. There are different types of Lipoplasty techniques and it can become quite confusing to select an appropriate procedure. In India one can gain a deep understanding of all the available options, procedural details, recovery times, and costs before making a decision about your surgery. Indian cosmetic surgeons offer the most technologically advanced minimally invasive lipoplasty procedures. Indian hospitals take pride on offering many different types of technologies under one roof. The advantage of this is that it allows them to use the technology that is right for you rather than resorting to a one size fits all approach. It also allows them to mix technologies to optimize your results. India ranks number one in hospitality. Numerous cosmetic hospitals in India have world’s best surgeons and the most compassionate team of health professionals. Cost of lipoplasty is the first factor that patients take into account when contemplating this plastic surgery. As with all forms of cosmetic surgery, lipoplasty surgery can end up costing a lot of money. However, due to the ever-increasing rivalry from competing providers, the enhancements in technology and the ever-growing popularity the cost of lipoplasty has stabilized over recent years. In India cosmetic surgery has been attracting millions of people from all across the world. People opt for cosmetic surgery like lipoplasty in India so that they can avail the benefits of the low cost. The cost of Lipoplasty if compared with other western countries brings a saving of over 50%.